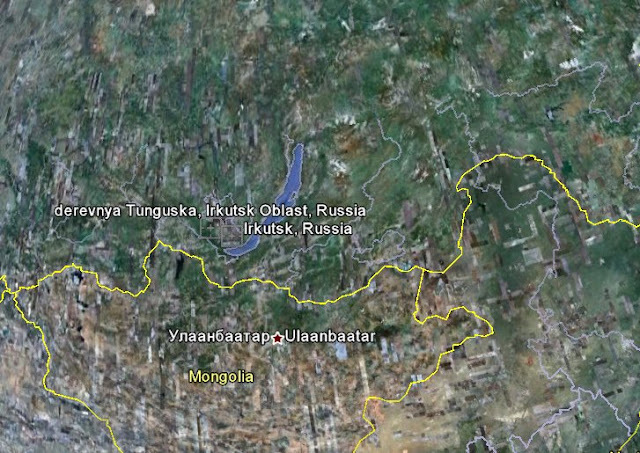 Followup - Ufo crash in 2011 over Irkutsk Siberia strangely very close to Tunguska 1908 crash site - why? I've posted about this report before but a few puzzeling questions have been raised by RealUfos readers about this apparent huge Ufo/meteor crash. Over the years the have been many strange Ufo & meteror crashed over remote regions in Siberia.. Im not sure why? Most interestingly, I have been advised that the Crash in Irkutsk occurred very close to the famous crash site in Tunguska which had an apparent Ufo/meteor crash recorded back in 1908 (more about this case). Sadly we haven't heard any more on the Irkutsk case because its been reported the Russian army took over the operation as a classified event.... If anyone in the region or anyone else who knows more about this case can provide further information it would be appreciated. Also if someone speaks russian to possibly provide as a reply, a translation of this newscast below, it would really help. Residents of the Irkutsk region in Siberia see a UFO for a second day in a row, and it is all looking less and less like a meteor burning up...the official explanation. Its very weird that this crash happened very close to The Famous 1908 Tunguska crash site. There are theories that a Ufo crashed with a Large Meteor in 1908 to save Earth.. could this have happened again? I've just found a possible good clue for my time tunneling hypothesis (see my previous comment). Let's consider the Earth precession in the years since 1908 (Tunguska event) to 2011 (Kirkutsk event), at 52 degrees latitude. It would give, if I didn't make too many mistakes, a difference of about 97.4 kms ... That's very near to the effective (space) distance value! Initially I thought the time travel should spring out matter-energy to the same exact place (I mean relative to the same physical objects next around). But maybe I was wrong: instead, we should look to the 'fixed (far) stars' frame for any Time travelling. So it could be not strange at all to find out a precession effect in such case. What happened to the video?? Almost every video of this on youtube has been removed. Why? Who were the YouTube account holders who uploaded it? Can you send us the video? deleting videos is an evidence that there is a genuine cover-up on the topic. Time will tell! Oh my god you people are so utterly deluded! E.g. 'possible time tunneling of energy in the multiverse'?! Hey, here's a probably explantion (apologies in advance for being so rational) but maybe, just MAYBE Russians possess a sense of humour and this is all a big wind up?! As a country nobody wastes time and money on humor.